"I've been a professional rugby player for 20 years, I've reached my ultimate goal of making the All Blacks and 2 gold medals for NZ 7's team. I spent 10 years at Northampton Saints where Vicky was our sports masseur. Vicky's energy and enthusiasm in what she does for her clients is outstanding!! Vicky is the best Masseur I've had in all my career. Much so that when ever I'm in the UK on my busy schedule I always find the time to book in for a massage. I would highly recommend Vicky Clarke to anyone!" "I have scoliosis of the back which also affects my neck and head. I have over the years tried lots of different treatments to help relieve my painful symptoms. The treatment itself was quite intense at times, I really liked the stretch it felt so good. I was really tired when I got home but the next day, my back and neck really felt wonderful, no tightness, along with a feeling of well being, which was an unexpected bonus. The Thai massage/stretch that I had is one of the best treatments that I have received to date." "I visited Vicky today for the first time. Prior to the session I’d been having a lot of pain in my calf and hamstrings but Vicky’s great work has certainly helped loosen things up. She’s super friendly and has a lot of experience when it comes to training and therapy. Will definitely be visiting her regularly now! " "Had my first treatment today and am already feeling the benefits - my neck/shoulders/back feel so much better as they were very tight! It is the perfect remedy for all the aches and pains from work and sports. The premises is easy to find and I found it no trouble to park. Vicky is super friendly and puts you at ease straight away. Will definitely be booking in again! " 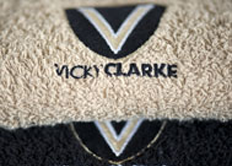 "Vicky Clarke has a wealth of experience with abilities that are second to none in her field of expertise. I can recommend anybody to use her as she is a pleasure to be treated by and takes great pride and joy in the work she does and for the people she treats." "I was introduced to Vicky by my sister who also goes to her. I have long standing back and neck problems, the first couple of visits were tough, but now I visit Vicky regularly and she keeps me stable and mobile and I would recommend her to anyone she's also a lovely lady as well." "Professional Golf is synonymous with lower back problems and after 40 years of practicing and playing I was getting to the stage where my back would go into spasm every few months and a friend of mine recommended going to see Vicky and I haven’t looked back since. I have had regular therapy every two weeks and have not had major problems for 5 years and have much more flexibility and am able to continue practising and playing the game I love. Vicky is extremely proficient and has a great sense of humour and I am very grateful for all her efforts to enable me to carry on playing." 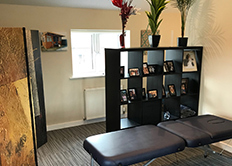 "Having completed a Half Ironman and many Olympic distance races I have found that seeing Vicky for regular massages has really helped get me to the start line. Thank you Vicky you're a star." "A thoroughly professional and very talented therapist who has looked after me for about 20 years now! With past experiences at Scottish Rugby and Northampton RFC can certainly help many physical problems. Highly recommended." 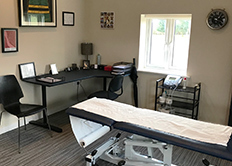 "I have been receiving from Vicky regular massage for my chronic migraine condition and related neck/shoulder problems over the last 14 years. Having suffered from a chronic migraine condition, with at least two attacks a month for much of my adult life, Vicky has helped me manage recovery from these, and prevented others, by instinctively locating and working on the trigger points connected to my problem. Thank you Vicky for enabling me to always leave your sessions feeling able to get on positively with life. I have recently published my first novel and of course the intense computer work hasn’t helped my neck aches and pains – without Vicky I would never have got to the last Chapter!" "I have known Vicky and been treated by her for around 3 years now. I compete in Seniors National Level Tennis Competition. I practice most days and have tournaments most weekends. Vicky has provided me with pre tournament massage and recovery massage following events. She has also treated various injuries along the way mainly to my upper and lower back. I felt results from my very first appointment with her and as an athlete herself she fully understands my requirements. She has been fundamental in me being fit enough to compete as often as I do. Without her help I would not have been able to play as many events as I have been. I would highly recommend her. She is knowledgeable, professional and extremely relaxed and friendly. I've had various people treat me over the years and I've had my best results by far with Vicky." "Firstly Vicky’s room was very warm and welcoming and that is parallel to reflect on Vicky's professional and attitude also. The massage was gentle but firm and helped me to relax whilst easing away any strains in my muscles. I found my feet particularly tight and also my hip area which seems to have now benefitted massively from Vicky’s manipulation of it. I enjoyed the stretching very much and felt my body lengthen and relax at the same time. Today I honestly feel refreshed and cannot thank Vicky enough. I managed to go for run today, plus bike and swim. I would recommend her to absolutely everyone." "I've reached my ultimate goal of making the All Blacks and 2 gold medals for NZ 7's team. She is the best Masseur I've had in all my career. I would highly recommend Vicky Clarke to anyone!